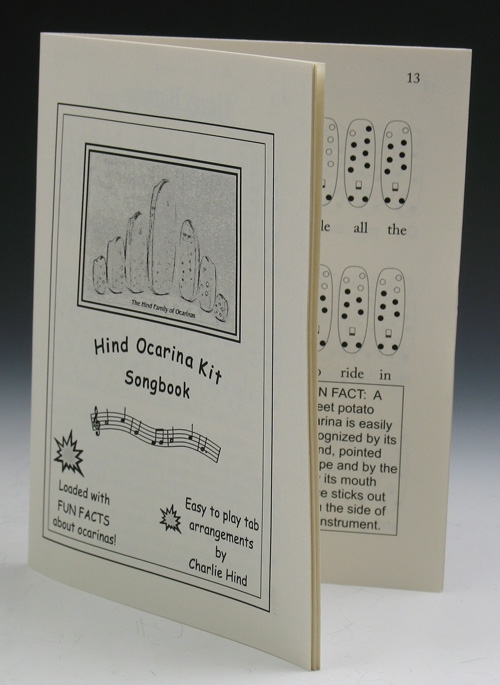 Inline Ocarina Songbook ~ New! This 16 page booklet is the companion songbook for my new Inline Ocarina Kit. The fingerings for each note are shown in tablature (small diagrams) above each word of the song, so anyone, even young children, can learn to play songs without the ability to read music. The book is also loaded with FUN FACTS about ocarinas. Learn where they came from, who invented them, and lots of other interesting information about their history...educational AND fun! It is the perfect songbook for anyone learning the inline ocarina, and it also works for my inline tenor. Home On The Range, Tom Dooley, Yankee Doodle, Song of Time, Happy Birthday, Simple Gifts, Oh Susanna, God Bless America, We Wish You a Merry Christmas, and I've Been Working On The Railroad, Happy Birthday, Row Row Row Your Boat, The Caissons Song, Camptown Races, Jingle Bells, Clementine, Zelda's Lullaby, The First Noel.